Controls hair and gives it an intense shine. 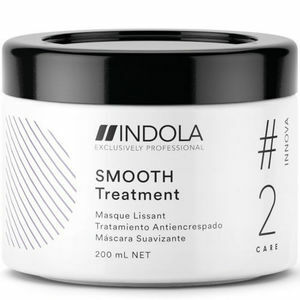 Indola Innova Smooth Treatment Masque represents step #2 in the Indola Innova Smooth hair care programme. It's formulated with coconut oil and provides a lasting control and discipline to your clients' hair. It delivers anti-frizz protection and smooths the cuticles, employing Indola's pixel technology to bring hair back to a virgin-like quality with glorious colour shine. £6.84 (inc. VAT) Why no VAT? We're a trade wholesaler and quote our prices without VAT to help our VAT-registered customers understand the true cost of a purchase. Lock in nutrition, protect hair from damage and restore its natural vitality with this silicone-free tonic. Comes in a 250-ml pump-spray bottle.